In a messy tangle of streets, in the Bermuda Triangle where the 55 freeway turns into Newport, stands Growers Direct, a small market which sells fresh and seasonal produce. It's mostly known only to locals who enjoy the good fortune of having a veritable farmer's market that's close to home and open everyday. Entering the store, your eyes are immediately assaulted with more vibrant colors than a television test pattern. Then your olfactory sensors are smacked with the floral aromas of ripe fruit and the fresh bounty of the garden. But before you collapse into a botanical stupor, pay attention or else you'll be run over by the ever busy stock boys, who are constantly on the move, replenishing the supply and removing any undesirable pieces from the lot. Minding your step, pick up a hand basket and help yourself to a sampling of mother nature's greatest offerings to herbivores. Verdant celery stalks, cold and crisp, its green sprigs are still misted with beads of dew. Tight bundles of spring onions with its hollow tubes standing as straight and rigid as sticks are colored like the deepest and darkest emerald. A carefully arranged pyramid of spherical honeydew melons has a sweet fragrance which snakes up and invites all passing nostrils to take a long, deep sniff. The zucchini has soil still clinging to it, having been pulled out of the ground barely hours before. Crimson tomatoes, round and plump, which has taut, smooth skin with nary a blemish could stand its own against the Noxema girl. All this at prices you'd normally find at Asian or Mexican grocery stores. By this, of course I mean "cheap." More money left over for paying off that convertible! Grower's Direct is crazy, isn't it? You can hardly believe that you're seeing such gorgeous produce, and in the winter no less. And the prices? Unnn-ba-leevable! Just spend $20 and your refrigerator will be crammed with more fruits and veggies than you know what to do with! Do check it out in the summer! Then things really get insane. You won't believe how many different varieties of peaches, nectarines, and berries that they carry. And what makes a visit to Grower's Direct even more perfect? A short drive down the street to Trader's. Talk about doing a Snoopy Dance! I love the 55 freeway comment! I always get confused around there. Every neighborhood should have a good produce shop. sounds liek a real winner. Going to have to check this place out. I can absolutely relate to the Bermuda Triangle comment. Elmo- thanks for the heads up. I'm always on the prowl for good produce since I'm a veggie and salad junkie. This looks like a real gold mine. BTW...thanks to all those that expressed concern over my blog's disapearance and reached out to me. I was very moved. Everything is fine, it was just time to pull the plug and become just a reader of great local blogs like Elmo's. Keep it coming Elmo. I love places like this. Looks like I'm going to have to add this to my list of OC places to go to. Maybe I can make a day out of this and Sushi Shibucho. I am envious. Phoenix does have a great share of produce markets in the summer (all that corn and lettuce), but I am still envious. Snoopy Dance indeed! One of the jewels of O.C. I think someone on Chowhound once lamented that her secret was out. To think how long I wouldn't have known about this had I not found myself by accident! Yeah, this area is not only confusing to navigate and densely packed with traffic, but now they've added cameras at most of the lights to snap a picture of your license plate should you make a mistake! I think you'll like this place. BTW, thank you for posting and letting all know that you're okay. We've appreciated all the insightful posts you've given us. As other's have said, your blog will be missed. Absolutely! In fact, Sushi Shibucho and Grower's Direct are practically in the same neighborhood. Mere blocks from one another at the end of the 55 freeway! HA! No it was someone else's red convertible. But it made for a nice picture and story! I think I do remember seeing prickly pear pads there. Hopefully I wasn't just imagining it. I just found your blog after doing a search for "Kappo Honda" (you had a post from back in Oct '03). This is really cool, esp. since I live in OC--you are on my CA blogroll! I am proud of you Elmo. I hope that you bought a lot of greens (for a few greenbacks), because I've officially taken it upon myself to make sure you eat healthy and nutritious foods! Make sure you get some of those fresh, unblemished celery bundles to munch on during work! Welcome! I'll be posting more on OC eats so hopefully you'll come back from time to check in. 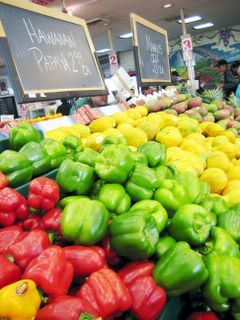 Hmm...do you know any Farmer's Market that's like this out here in LaLa land by chance? Looks like there's something in Marina Del Rey that is similar. Check out this post on Chowhound. GD was the only place i could find forelle pears for my culinary competition at a decent price. 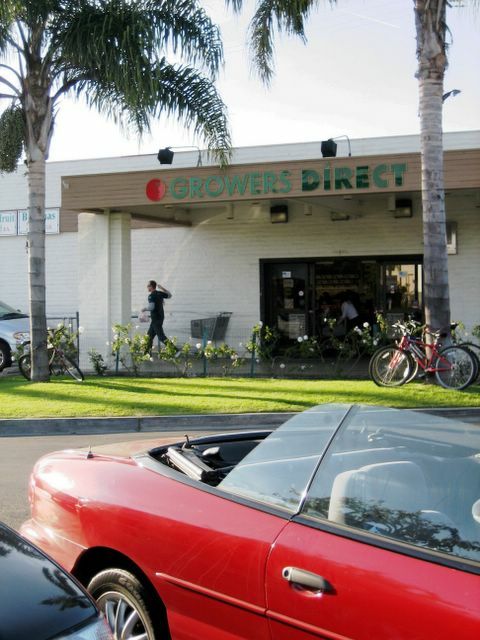 forget about bristol farms when you have growers direct. 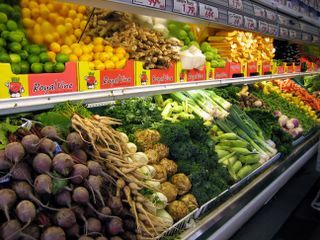 however, i still shop for produce in the following order: vietnamese markets, persian, korean, trader joe's, grower's direct. We call it the Costa Mesa triangle at home...where the 405, 55 and 73 all cross. Got lost in it for years! I moved to S. county over a year ago, and I still make special trips to C.M. just to go to Grower's Direct. Their produce is always fresh, always cheap, always delicious. Another similar spot that is also great is Farmer Boys in Anaheim, for those of you in N. County. Please if anyone knows of other like places, please post. Farmers market? Yeah right. What a scam. Do you have any idea where Growers Direct sources its produce? Everything in there is not organic or GM free. Ask a member of staff where the produce is coming from and they'll probably say "Bermuda Triangle". Its a scam & whats is going on in the food industry is sickening. There is very few places in california where the food can actually be considered healthy (even the stuff you think is healthy is very bad). Its unfortunate that it is so hard to see when it changes just a little everyday. Google Cloned meat, HFCS, Grass fed and thats just the tip of the iceberg. I found out about this place about two years ago and love going there. The produce is much less expensive than at the regular grocery store, and the quality seems to be a lot better. I recently bought strawberries there and they were delicious! Does anyone know if Grower's Direct is all local? I have a feeling it isn't... some packaging states that it's from Mexico, if I recall correctly. Is there any store similar to GD that actually has organic and/or locally grown foods? If not, we need one! I know that Tanaka Farms is in Irvine w/ an open stand, and South Coast Farms is in San Juan w/ a small stand as well, but isn't there a store somewhere that focuses on not only these farms but others located close by? We just came from there and it is very nice. Produce may not be the big "O", but taste very good and fresh. We live in S. Redondo and have a similar store "Sprouts.". Actually Sprouts is a small Whole Foods with better prices for food items.. The vegetable prices for non-Organic were even cheaper at Grower's Direct and just as good quality.